Bikini ready, er no! Not in any way, shape or form. The annoying thing is that in the picture below, I am back to pre pregnancy weight but not shape. 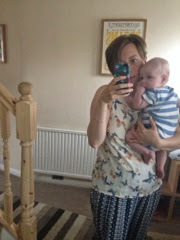 I'm still in maternity trousers and loose fitting tops. 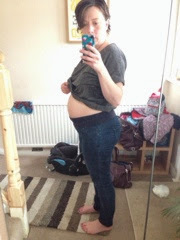 I've lost a stone in four months by following the Slimming World mantra as previously blogged about. 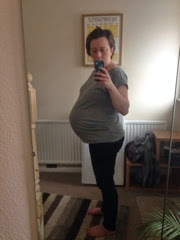 My main trouble now is that I incurred Diastasis Rectus Abdominis which is where the muscles tear apart to allow for baby to grow but don't knit back after pregnancy. The way to check if you have this is being able to insert fingers in the hole near your belly button (google it and there are various youtube videos on how to see if you have this). So in the picture above, that there is some fat undoubtedly but also my internal organs poking through the thin layers. Eewww! 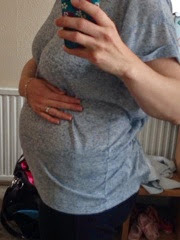 My bump was extremely front loading which at the time I thought was good but turns out it put too much of a strain on my now flabby muscles. I've done my research and had some brilliant advice on what to do via Instagram (I'm @bubbababble if you want to find me). As I now need to strengthen the muscles and try and get them to fuse together it's a case of doing specialist exercises and no crunches or planks as these make it worse. I hate that I still look pregnant and my daughter mentions my big belly. Looking on the web I came across Bikini body mommy on YouTube and she has a whole (free) fitness program on post pregnancy. I tried but needed a slightly shorter work out so at the moment I'm doing Vicki Pattinsons 7 day slim. It's perfect in that it's 10 minutes of cardio a day, all simple exercises that use your own body weight rather than extra equipment. Just what I need as I tend to an exuberant toddler in the summer holidays and a baby. I'm also doing the Postnatal Slim down by Lindsay Brinn and concentrating on the core exercises especially for this condition. It's hard work but I really want to wear my own clothes again and not buy the bigger sizes because they don't fit. I hope I'm slowly getting there and I've been out a few times (although I felt completely self conscious). I still can't bring myself to put a swim suit on but hopefully by our holiday next month I will be able to wear one. Fingers crossed.